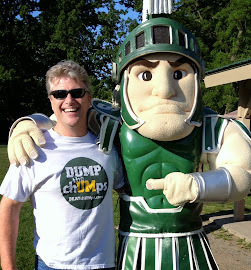 DUMP the chUMps (Spartan Resource): WHY WE CALL THEM "chUMps"
It was several years after graduating from MSU that I began to see the problem with U-of-M. Give credit to Glenn Shembechler for my period of enlightenment. It was his behavior that began to open my eyes. Rick Leach and Antoine Joubert deserve an assist on the play. I grew up in Spartan Country, yet never heard about the University of Michigan on a daily basis. I literally didn't know about them. They meant nothing to me, so I never cared about them. I noticed that fans at Spartan Stadium would cheer when they were losing and boo when they were winning, and it only made me wonder why others cared about UM. But I gradually became aware of the recent (at that time) history between MSU and UM, and how the Michigan Machine tried in every way possible to deny my school entrance into the Big Ten. Even as I learned about their opposition to us, I didn't really care, since we made it into the conference and had done quite well. Some friends headed down there after high school, and I visited often, always for non-academic activities. I learned that the epicenter of non-academic activities was the University of Michigan. I learned that UM was the ultimate "party school". I learned that you could do ANYTHING down there, especially of a non-academic nature. So it became somewhat amusing to hear Michigan people carry on so much about their "academic tradition", as I knew firsthand that there was a lot more than "academics" going down on the UM campus. Still, no reason to hold them in disregard. I did notice that MSU had a devil of a time beating UM in football and basketball during the 1970's, so I began to treasure any wins we could get against them in sports, but that was no reason to hate them. Just because some other team is good is no reason to hate; there would have to be some other behavior(s) to warrant that level of emotion. So I was pleased to be invited to attend the MSU-UM football game in 1984 by a friend, even knowing that he would be rooting for his team and I would be rooting for my team. During pre-game introductions at that game, I conspicuously rose from my seat when Coach Slumbuckler was introduced and gave him a personal standing ovation. This drew funny looks from the UM fans in my vicinity, but I wanted to express my respect for a tough opponent. 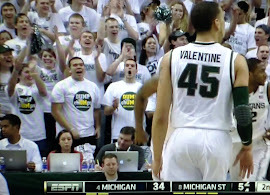 MSU won that ball game, which was a surprising and very pleasing outcome to me. I eagerly awaited the newspaper reports on Sunday, as I wanted to read what the great Blow Scumsucker was going to say about my victorious Spartans. After reading every single article about the game that I could find, I was still looking for his comments about the team and the players who just beat him in the Pig House. There were none. He had nothing to say about Michigan State. He only had bad things to say about his own team and players. This was disappointing, as I had developed great respect for George Perles when he congratulated the opponent after they beat him on the field. Coach Perles always said good things about the other team. As time passed that season and beyond, I started looking for the Miami Man's comments after losing a game. Turns out he NEVER had anything nice to say about a team that beat him, only bad things to say about his own team. This gradually diminished my respect for the man who fired Ernie Harwell. It also made me pay more attention to the relationship between the two schools. Rick Leach spit on MSU fans at a baseball game. Antoine Joubert mouthed off against Scott Skiles and was double-dipped in 1986. Ed Martin became a household name. It gradually became clear that there really was a "Michigan Difference", though it was a sharply negative distinction. What makes them "different" is that they are self-absorbed narcissists with a supremacy-complex; they actually believe they are better than everybody else. They claim to be better, but they actually lie/cheat/steal and misbehave at a rate equal to or greater than most. And they own the mass media. Once I noticed how the media worshipped UM, the problem really started to get under my skin. You would have thought the men's basketball scandal would have turned the tide, but it was largely ignored by the media in order to perpetuate the positive stereotype. 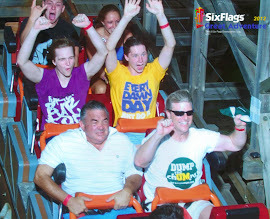 I also noticed how some people called them "scUM" and wore shirts that say "Muck Fichigan" and "Ann Arbor is a Whore". I found these to be amusing, but maybe just a eentsy-weentsy bit too harsh. Quick note about Ann Arbor. Not only is she not a "whore", she's a pretty nice city. Lots of good things about that city. Biggest problem is the stink-hole right in the middle of town. But I digress. It gradually occurred to me that we needed another name for these fools, because just calling them "fools" was not a good enough description. So we call them "chUMps". 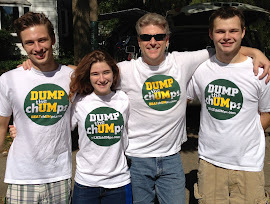 "Chump" is a derogatory slang word to describe a person who is displeasing and/or stupid. The word also denotes a person who "tries to act cool, but is really a fool and tries to act tough, but really isn't". It may sound bad, but it never made George Carlin's "Seven Dirty Words" list. It's definitely a put-down, and definitely well-deserved, but it's not profane. 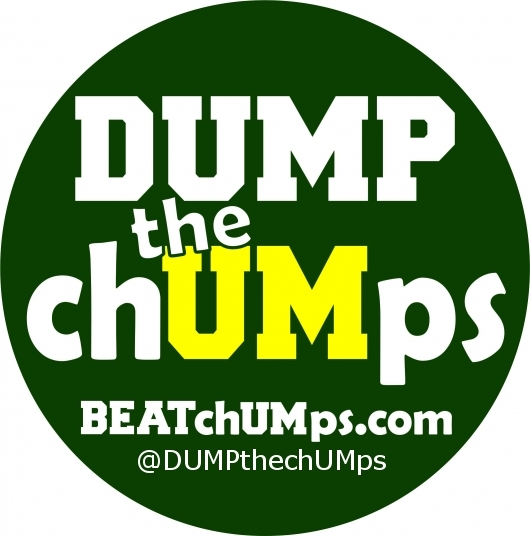 Some Michigan fans don't deserve to be called chUMps, but for most, it's about right. It's important to give people the benefit of the doubt when learning they root for Michigan, but their fan-base on the whole is comprised of many thousands (or even millions) of bona-fide chUMps. 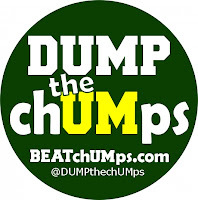 Remember: You can't spell "chump" without UM. 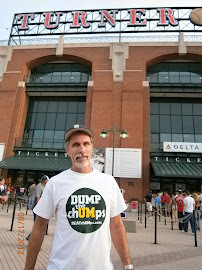 Also see: "NOT ALL MICHIGAN FANS ARE chUMps"
This Post is a Masterpiece. A true work of art that speaks to the to the inner Spartan in all of us. Thank you SM82. While we invite comments and all views, there is a level of appropriate language we expect. We have fun on this site. It's not a hate site. Since the anonymous chUMp's comments contained language that I would not want arriving in my family's inbox, it has been removed. My apologies to those who receive comments via email. The comment from Anonymous, an obvious Walmart Wolverine chUMp, said something about an "A** kicking". One of the Detroit Free Press writers did mention that the game was a "disembowelment". I guess that can happen when you receive a true "A** kicking". I doubt we'll hear from Anonymous anytime soon. I would only add never hire a wolverine. The arrogance they swim in always causes problems with co workers. They are really as a group not nice people. We avoid Duke grads also because of similar issues. They actually...both schools...have been terrific at selling the county they produce a superior product. The university has a big stadium and an ego to match but talent is everywhere and with a lot less egotistical baggage. We prefer graduates from schools that teach and teach how to learn not schools that rely on old magazines that rate the most arrogant the highest. I'll take a CMS oredigger or an aggie from texas over a pompous um grad ANY day and do. Besides the cheating um and osu seem to enjoy is what makes the rest of the country laugh at the Big 10. 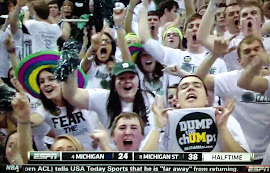 DUMP the chUMps SHIRTS INVADE THE IZZONE ON ESPN!